This story is used to participate in MLMM writing prompt “Time’s Up”. It tries to illustrate what happens when a deceased person can not accept that it is Times Up for them. The dead thinks they have unfinished business on earth and insists on returning. They lack a corporeal body and physical resources to accomplish desires. They visit the living in dreams, to pass messages and requests to get things done, on their behalf. 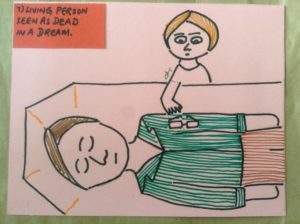 Dreaming of dead people being alive & alive people being dead – These are two variations of the category on dreams of dead people. death – A dream of death interprets as threat, anxiety, fear of loss, symbolic death of person is loss of person, death of a relationship. 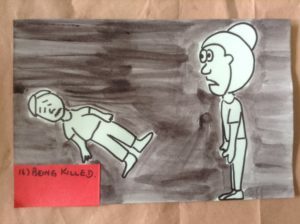 To dream of someone’s death can have various meanings, as explained above. Have you ever dreamed of a dead person? There are several dream interpretations of seeing dead people. The most common one is about nostalgia. You may be missing the deceased and your brain activates memory cells that stored images of the deceased. As much as we would like to believe that a dream of a dead person is a message from them, we have no scientific evidence to back up this claim. Instead of debating on this, we focus our attention on what are the common dreams on dead people. 1) Getting a goodbye message. 4) Reminder to complete unfinished business. 5) Guilt over lack of religious rites. 6) Harbinger on future event. 8) Showing where the deceased is residing now. 9) Nostalgia for old times. (1) Dreaming of a dead person like receiving a farewell message. If you grieve for the deceased, you are mentally, emotionally and physically stressed. At one point, fatigue sets into your mind and body. Your brain tells you to stop mourning and move on. You accept that the dead has passed into another dimension. Some bereaved relations virtually will themselves into dreaming up a farewell where the deceased says goodbye. Women are especially affected by death and removal of their charge. Many women assume the nurturing role and this is difficult to let go even after the death of their charge. They wonder how the deceased is doing in their afterlife. Extended thoughts about the dead works up the brain to dream of the subject. Have you dreamed of a living person seen as dead in your dream? Many people think that this kind of dream portends the impending death of the subject. Research on dreams say that this type of dream is more symbolic than actual reality. You may have experienced anxiety and threat over losing the person. The subject may be in poor health or endangered in some way. The symbolic death could be a manifest expression of the latent meaning which is the dire strait of the subject. Conversely, have you dreamed of a dead person being alive in your dream? This dream could have been created because of nostalgia for the dead, rehashing old memories on past experiences with the deceased, or any of the nine reasons stated above. Common dream symbols are not really necessary when dream interpretation depends on themes. Instead of looking at interpretations behind each dream symbol, we look at the general themes in the dream. They are anxiety, threat, nostalgia, arrested development (incomplete or unfinished business), guilt over incomplete closure and etc. A common dream symbol holds meaning specific to the dreamer’s culture. One object may hold different connotations in various cultures. Thus it is insufficient to rely blindly on a dream dictionary for interpretations. So this is what I would like to convey – Welcome to Art Mater, where dreams are explained as to how they become reality. With the help of Art Mater, which is Latin for Mother of Art, I draw and illustrate dreams and more. Would you like a free dream interpretation? Just write about your dreams in the comments and I’ll get back to you ASAP. She follows her dream to study psychology. 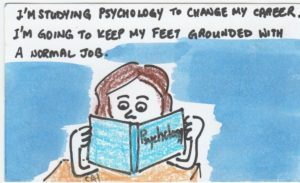 This art documents her journey studying psychology. What are your reasons for your choice of study? Thanks for sharing your thoughts on this topic and linking them with this week’s tale weaver.